Earlier this year I randomly decided to book a ticket to visit Istanbul, Turkey. I had been traveling through Europe for about a month when I made the decision to go from the sunny city of Barcelona to Istanbul. I was greeted by two friends at the Sabiha Gokcen International Airport on the Asian side of Istanbul. Istanbul is a bustling, thriving metropolis of 14 million people in Europe and Asia, split down the middle by the Bosphorus. I was immediately struck by the sheer size of the city and the differences in architecture because of the stunning, towering mosques. We awoke to the sounds of adhan, "the call to prayer," being called out over the outdoor loudspeakers that are mounted on tall minarets. Most importantly, I was struck by the many culinary delights of the city. In this article, I want to share my favorite suggestions of where to experience the best eats and drinks in Istanbul. 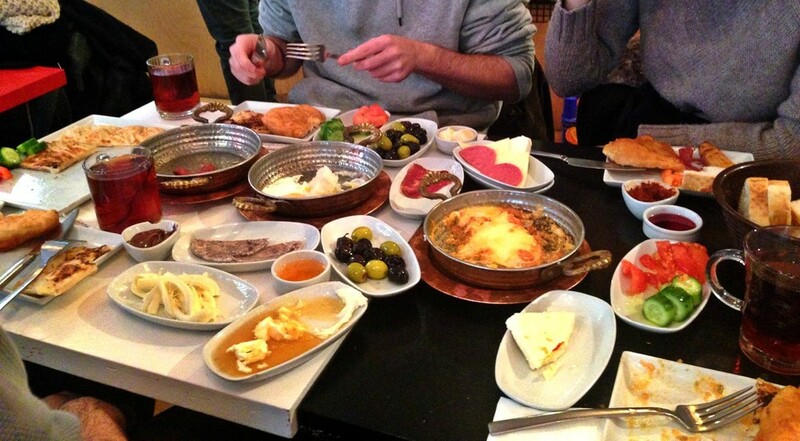 You can find great Turkish breakfast in the BEŞIKTAŞ neighborhood. There are many winding streets here that are full of cafes. You really can't go wrong! I would head on over to Taksim Square morning, day, or night. There is always a vendor selling corn and chestnuts in this area. For a fun evening out you could grab some street food and then head to a bar like SekSek. For juice, I don't have a specific recommendation of where to find it because it is everywhere! There are vendors selling orange and pomegranate juice in restaurants, from carts, and on the streets. It is incredibly cheap at around $1 per juice. Most definitely worth a try! Drinking a traditional Turkish Coffee is a must. I would recommend Mandabatmaz for coffee. If possible, visit with someone from Turkey. They will show you the tradition of reading your fortune in the grounds of your coffee. Raki is the Turkish national drink made of twice distilled grapes and aniseed. The color is why it is referred to as Lion's Milk. 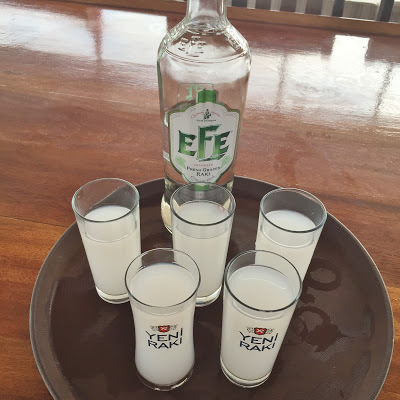 There are many different traditions surrounding the drinking of raki, but it is most common to drink your raki with cold water and ice cubes. Try it out atÇukur Meyhane in Beyoğlu. 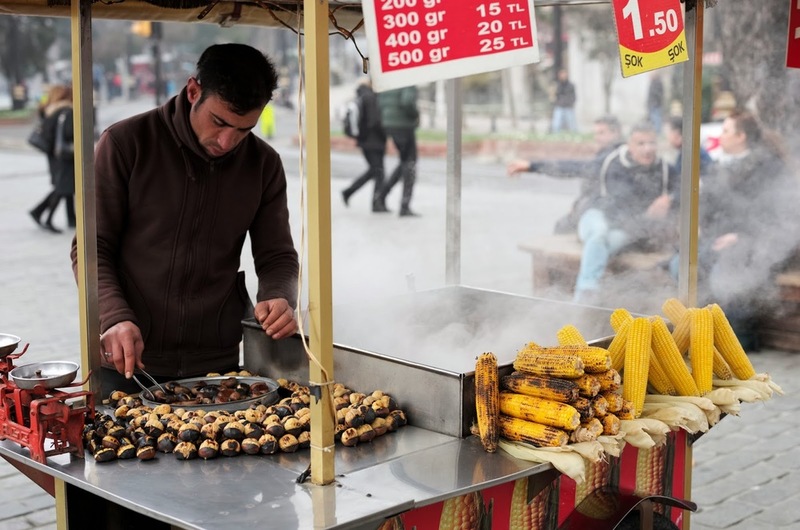 Similarly to the roasted corn and chestnuts, Simit and tea can be found just about anywhere. There are food carts all over the city where they are being sold. If you are on a budget I would recommend you visit Simit Sarayi and go for the Simit sandwich with tomato and cheese with a Turkish tea on the side. 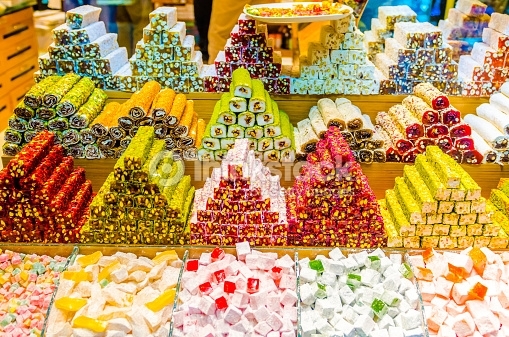 Visit the Spice Bazaar in Istanbul for Turkish Delights. You will be greeted by mountains and mountains of the many different varieties such as pomegranate + pistachio, mixed nut, citrus, hazelnut, and many more. If you are simply looking to have a unique and satisfying meal in Turkey, my best recommendation is to go to Tavanarasi.